GLIPS Graffiti editor is a cross-platform SVG (Scalable Vector Graphics) graphics editor for Windows, Mac OS and Linux. 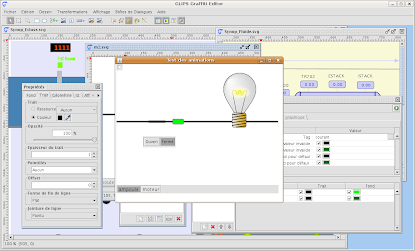 GLIPS Graffiti Editor will enable the creation of regular SVG files and SCADA HMI applications that can connect to any data provider. GLIPS Graffiti editor provides Path tools to draw Bezier curves, conversion to a path, union, subtraction, intersection; Shape tools to create rectangles, circles, ellipses, paths. GLIPS Graffiti editor allows you to do vector graphics transformations including translate, resize, rotate, skew. It also features group editing, basic text support, images import, and export to pdf, png, jpg and bmp formats. GLIPS Graffiti Editor requires JAVA VM 1.5 or higher.